Background: Various ginger compounds improve gastrointestinal problems and motion sickness. The main effects of ginger allocate to some phenolics such as gingerols and shogaols that act as their active agents. Chewing gums are among convenient dosage forms which patients prefer due to their advantages. Hence, this study tried to design, formulate, and evaluate ginger chewing gum of favorable taste and texture to avoid motion sickness and have gastro-protective and anti-oxidant effect. Materials and Methods: Dried ginger rhizomes were percolated to extract ginger compounds. Total phenolics were measured in 70% hydro-alcoholic extract of ginger by gallic and tannic acid standards using Folin–Ciocalteu's reagent. Chewing gums containing 50 mg of concentrated extract were prepared. Content uniformity, weight variation, release pattern, organoleptic, and mechanical properties were evaluated. Results: Phenolic content was measured 61.50 ± 5.27 mg/g and 76.75 ± 5.45 mg/g of concentrated extract as gallic acid and tannic acid equivalents, respectively. Release pattern of formulations with different gum bases and sweeteners demonstrated almost 100% release of drug. Evaluation of organoleptic properties was on 10 healthy volunteers and later prepared formulations exhibited better characteristics. Formulations without any flavorants have higher acceptability. Evaluation of mechanical properties showed higher stiffness of F15. Conclusion: Ginger chewing gum comprises admissible properties to be used as a modern drug delivery system due to its advantageous results in motion sickness. It passed all the specified tests for an acceptable chewing gum. Thus, it may be successfully produced to help GI problems. The chemicals responsible for ginger's properties are considerably variable, the main components are gingerols and shogaols and their homologues which are responsible for its pungent taste. These nonvolatile phenol compounds provide a hot and sharp sense at mouth. Other nonvolatile phenolics are paradols and its derivatives and zingerone. Volatile oils of ginger contain of sesquiterpenes hydrocarbons, zingiberene, farnesene, curcumene, bisabolene, and a small fraction of monoterpenoids, which include cineole, linalool, citral, phelandrene, etc. Some other flavonoids and phenolic constituents exist in ginger, e.g., gallic acid, tannic acid, catechin, epicatrchin, rutin, etc. Phenolic compounds of ginger although have anti-oxidant effect and scavenge free radicals to prevent cancers and metabolic disorders but the actions of gingerols, shogaols, paradols, and zingebrene are significant. They improve GI tract motility and antagonize the action of 3-hydroxy triptamine (serotonin) in guinea-pig ileum.,,,, They also have anti-5HT3 effect on the nervous system due to their low molecular weight, which allows them to pass through blood brain barrier. These active compounds inhibit the growth of Helicobacter pylori in GI., They also prevent gastric dysrhythmias and rising of plasma vasopressin, which improve nausea during motion sickness. They may have anticholinergic and anti-muscarinic effects. The nausea and vomiting induced by cisplatin is significantly reduced by gingerol through the suppression of substance P and inhibition of serotonin and dopamine action. Different types and dosage forms of ginger show the importance and notability of this medicinal herb, but the researches indicate that ginger medicated chewing gum is absent among other ginger dosage forms. The aim of the present study was to obtain a new dosage form of ginger. Chewing a gum helps reducing nausea and thus, ginger chewing gum can even control nausea during motion sickness preferably. Considering the fact that ginger chewing gum has not been introduced to pharmaceutical market yet and various advantages of ginger which are rather accepted by people, we decided to formulate a ginger chewing gum that will be used based on scientific studies at pharmaceutical market. New dosage forms of drugs or herbs can persuade companies to welcome modern initiatives like ginger chewing gum. Ginger (rhizomes of Zingiber officinale Roscoe) was prepared from Gol daru Pharmaceutical Company (Isfahan, Iran) in 2011 and it was authenticated by Department of Pharmacognosy, Isfahan, School of Pharmacy and Pharmaceutical Sciences. Gum bases such as stick, fruit C, 487 and elvasti were prepared from Gilan Ghoot Company (Rasht, Iran), flavorants including lemon powder, cinnamon, eucalyptus were gifted from Goltash Company (Isfahan, Iran). Xylitol, maltitol, aspartame, glycerol, chloroform, acetone, sodium carbonate, and methanol were prepared from Merck Company (Germany). Folin–Ciocalteu's reagent was purchased from Merck Company. Absolute ethanol was prepared from Merck Company (Germany). The phenolic content was determined by an ultraviolet-visible (UV-VIS) spectrophotometric method (Shimadzu, UVmini-1240) using Folin–Ciocalteu's reagent with analytical grade of gallic acid as the standard. Preparation of stoke solution needed 500 mg of gallic acid dry powder which was dissolved in 10 ml of 70% ethanol, and then it was added to a 100 ml volumetric flask. For drawing gallic acid calibration curve, 1, 2, 3, 5, and 10 ml of stoke solution were added to distinct 100 ml volumetric flasks and were diluted with water. Reference and blank solutions were also prepared using Folin–Ciocalteu's reagent and sodium carbonate. After shaking and incubation at 20–25°C for 2 h, the absorbance of each sample was measured at 765 nm by the UV-VIS spectrophotometer. The method is almost the same as the previous method, but the standard is analytical grade tannic acid., 100 mg of ginger concentrated extract was added to a test tube, then 10 ml of 70% acetone was added to the tube, after ultrasonication by ultrasonic apparatus (Hwashin-Korea) for 20 min the sample was placed at refrigerator. The sample was then centrifuged at 3200 rpm for 10 min. For reference solution, 25 mg of tannic acid powder was dissolved in 25 ml of water. It was then diluted to 1:10. In order to draw tannic acid calibration curve, 10–100 μl of stoke solution was separately added to distinct tubes. For the extract sample solution, we added 50 μl of solution to a separate tube. Folin–Ciocalteu's reagent and sodium carbonate were then added to blank, reference, and test solutions. After mixing and incubation at 40°C and dark room, the absorbances of each sample and extract were measured at 725 nm. The results were reported in average after triplicate experiments. In the beginning of the procedure, accurate amounts of 4 different gum bases were weighed and heated up to 70°C in a water bath and then they were mixed and softened. In the next step, accurate amounts of liquid glucose, glycerin, and other sweeteners such as sugar, xylitol, aspartame, and maltitol were first triturated then added to the mixture of gum bases. After mixing, the temperature was set at 40°C. The concentrated extract of ginger and flavorants (if needed) were added. The uniform mixture was cut into similar pieces of suitable size and shape on a clean glass disc. We then packaged them for further tests and experiments. 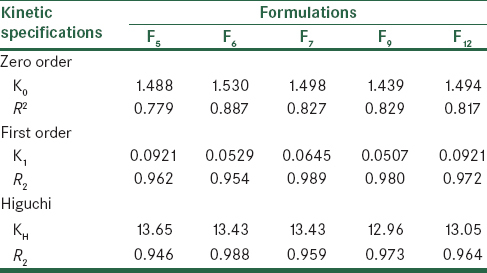 Different formulations of various gum bases, sweeteners, fillers, and plasticizers were prepared and better formulations with superior properties were the choice of further experiments as listed in [Table 1]. For single dosage units, 20 samples of chewing gum were selected randomly and the average weight was calculated, not more than 2 samples should differ the average weight. Maximum deviation from the average weight should be 5%. Ten gums were selected randomly. Each single chewing gum was dissolved in 25 ml of chloroform. The solution was then centrifuged at 3200 rpm for 10 min to use the clear supernatant. After that we used solvents such as phosphate buffer pH 6.8 to extract the drug in an aqueous phase. 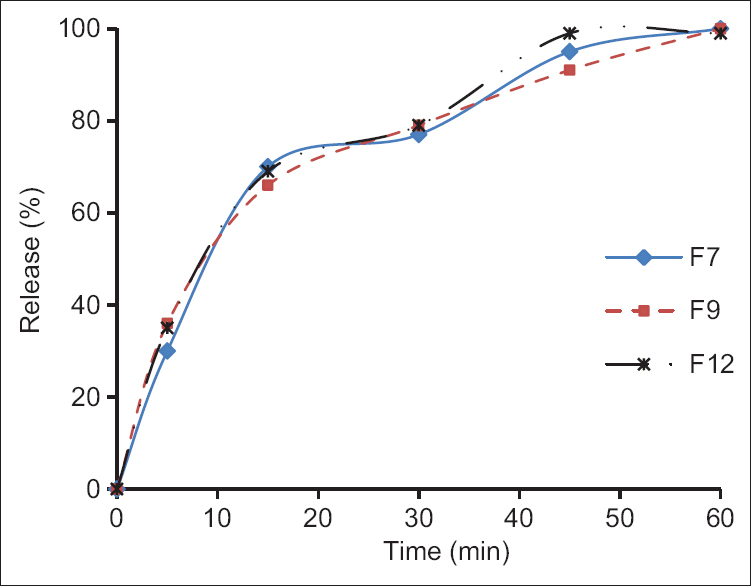 As the same way described before for quantification of phenolics, this time phosphate buffer was used instead of previous solvent to evaluate phenolic compounds and the curve was plotted. As gallic acid in phosphate buffer, pH 6.8 follows Beer–Lambert law, the amount of drug (phenolic compounds) was measured as gallic acid equivalent (GAE) by reading the absorbance at the wavelength of λmax 765 using the UV-VIS spectrophotometer. A placebo chewing gum which contained no ginger as the drug content was also dissolved in 25 ml of chloroform to subtract its absorbance from each dissolved ginger chewing gum. The in-vitro drug release studies were performed by a mastication device in which the chewing gum was placed into a release medium (50 ml of phosphate buffer, pH 6.8). The temperature of the medium was controlled by circulating water through a jacket that encircled the chamber of release medium. The temperature was determined 37°C ± 0.5°C. This device simulate human chewing characters like the number of stokes per minute (60 strokes/min). The triplicate experiments were performed on F5, F6, and F9 with different gum bases and F7, F9, and F12 with different sweeteners. The experiment was also performed on a placebo chewing gum in order to subtract the absorbance of each concentration of placebo from the equal sample. Tensile test as a suitable experiment in which mechanical properties of chewing gum are determined, was performed using a tensile testing machine (Santam Eng. Design Co. Ltd.). In this test, 3 different samples of chewing gum with different amounts of gum bases were gripped into the jaws of the testing machine. The rectangular samples had the thickness and width of 3 and 20 mm and the gauge length was 23 mm. The speed of 30 mm/min was applied to each sample to pull it apart until its failure. By this process, we plotted a stress-strain curve within which quantitative measurements of mechanical properties such as yield strength, ultimate tensile strength, modulus of elasticity or Young's modulus were obtained. Organoleptic properties refer to those which affect sense, taste, feeling, and so forth, so to affect the important and substantial role of these properties we need hard work and effort to provide an appropriate product that is acceptable by almost everyone. These properties include taste, softness/stiffness, bulk volume, persistence of taste, and adherence to teeth. For the evaluation of these properties, samples with different content of gum bases, sweeteners, and flavoring agents were prepared. The Latin-square design was then carried out on 10 healthy volunteers. After that, they were asked to score their points of view about above characteristics using Likert scale by assigned numbers from 1 to 5. A further taste panel test was also performed in which one of the best formulations among the most preferable ones (F15) was selected. 3 flavoring agents were added to it separately according to [Table 2]. These 3 new formulations and the best formulation without adding any flavorings were given to 20 volunteers. They were asked to score their points of view as assigned numbers of 1–5 according to taste panel test. Their scores were then collected. Finally, 2 best formulations that had the highest scores means the greatest acceptability by people, were given to 30 trained and healthy volunteers and their scores were also collected and evaluated as before. About 55 g of concentrated extract of ginger was obtained from percolation and removing of hydro-alcoholic solvent. Rotary evaporator and water bath were used to remove extra solvent entirely. The extract was kept in the refrigerator for further tests and experiments to avoid growth of microorganisms. Total phenolic content of the extract was measured by two methods described before. The content of phenolics as GAE was expressed as 61.50 ± 5.27 mg/g of concentrated extract and as tannic acid equivalent; it was expressed as 76.75 ± 5.45 mg/g of concentrated extract. All results are mean of triplicate measurements ± standard deviation. The curve linear equation for gallic acid was y = 0.130x – 0.048 (R2 = 0.9874) and for tannic acid it was y = 0.003x − 0.014 (R2 = 0.9977). Weight variation determination is a pharmacopoeia test for evaluation of weight uniformity of all chewing gums but as described in European Pharmacopoeia (EP) this experiment was performed on 20 randomly selected gums from formulations with best volume. The average weight was calculated and the range of their weights was 1.23–1.33 g.
Ten samples of the same weight were selected for content uniformity test. The average content uniformity of randomly selected gums was 0.90 ± 0.01 mg, which was obtained by the equation of y = 0.123x − 0.021 (R2 = 0.9792). The release of the active agent from gum bases is shown in [Figure 1] and [Figure 2]. The test was performed on specimens of different gum bases and different sweeteners. 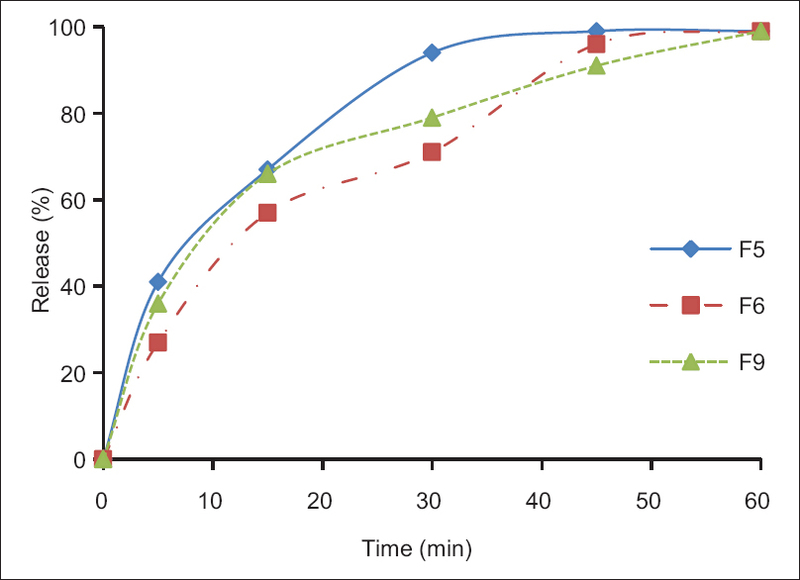 Our experiment was based on the standard curve of absorbance versus concentrations of phenolics as GAE in phosphate buffer, pH 6.8 which shows the equation of y = 0.123x − 0.021 (R2 = 0.9792). The drug released after 30 min was 94%, 71%, and 79% for F5, F6 and F9 samples respectively and the percentage of drug released after 30 min was calculated 77%, 79%, and 79% for F7, F9, and F12 samples, respectively. All the tested formulations released approximately 100% of their active agents after 60 min. 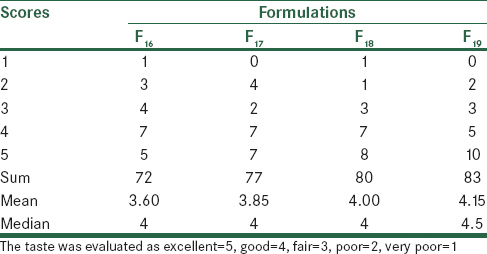 Organoleptic properties of all formulations which were gathered by scores of volunteers are shown in [Table 3]. Further amendments in the amount of ingredients modified the characteristics fairly. Based on the summations of scores assigned by volunteers to tastes which are shown in [Table 4], two different tastes were selected due to superior acceptability by individuals. Chewing gums with no flavoring agents earned more points than others as cinnamon took the second place by earning more points than other flavoring agents. F13, F14, and F15 samples were examined mechanically for evaluation of tensile characteristics. Their stress-strain behavior was illustrated in [Figure 3]. The Young's modulus of chewing gum were evaluated 1, 0.8, 2.06 MPa for F13, F14, and F15. Yield points of F13, F14, and F15 occur at stresses of 0.5, 0.4, and 1.03 MPa. The ultimate tensile strength of F13, F14, and F15 occur at stresses of 0.8, 0.55, and 1.2 MPa. In the present study, the phenolic content was evaluated 61.50 ± 5.27 and 76.75 ± 5.45 mg of gallic acid and tannic acid per gram of concentrated extract, respectively. According to Ghasemzadeh et al., total phenolic contents of 2 varieties of Malaysian ginger rhizomes were calculated 10.22 ± 0.87 and 13.50 ± 2.26; expressed as gallic acid per gram of dry extract. While the level of polyphenols extracted from ginger with ethanol and 50% aqueous ethanol were 111.60 ± 2.60 and 66.80 ± 2.10, respectively, as reported by Kubra and Rao. Total phenolic content in water extract of ginger was 89.50 μg GAE/ml of extract which was not concentrated as shown by Kishk and El-Sheshetawy  The differences of phenolic contents in these studies are due to the extraction type, solvent, and ginger species. According to a study by Pawar et al., the value of phenolic content in ginger was 12.40 mg of tannic acid per gram of dry alcoholic extract comparing to what was obtained from our study. The reason of difference is the same as mentioned for gallic acid before. Phenolic compounds in ginger such as gingerol, shogaols, and paradols, known as pungent compounds are imputed as free radical scavengers and antioxidants which are responsible for almost all of the ginger therapeutic effects. Hence, the aim of our study was to find a way to bring phenolic compounds into dosage forms.,, Ginger can be formulated as different dosage forms helping patients to avoid vomiting or nausea after chemotherapy or while motion sickness specially seasickness. It can also be taken by pregnant women in order to eliminate their nausea. Although other anti-emetic drugs are contraindicated during pregnancy due to their harmful results on the fetus, ginger has demonstrated no dangerous fetal disorders. In primary formulations, the volume and the weight of chewing gums were very low, but the texture was appropriate due to suitable preparation of all gum bases. Hence, we continued this proportion for further formulations. At first, the selected amount of concentrated extract was low in each dosage unit, so that the release and subsequently the effect of the drug were negligible. Thus based on the amount of ginger in other dosage forms, 50 mg per each unit was calculated as the best amount for applicable work and acceptable efficacy. In preliminary formulations, some volunteers pointed disappearing of sweet taste after 15 min of chewing but afterward further modifications in developed formulations eliminated this imperfection. These modifications consist of adding aspartame, xylitol, maltitol, etc. These sweeteners have much more sweetening power than sucrose. They also provide a long-lasting sweet flavor and promote the flavor more delightful and satisfying. It is considered that using the mixture of more sweeteners makes the flavoring system more admissible. The subject of using flavoring agents in our formulations was the topic of discussion because ginger has a pungent taste and spicy-sweet aroma, which most of the volunteers preferred to other tastes or mixture of ginger taste and flavoring agents. In fact, ginger makes a new and warming taste among other medicated chewing gums. Our drug, as the active ingredient has a very dominant flavor, so masking the spicy and pungent character of this ingredient required high amount of other flavoring agents, which may interfere with our experiments, tests, and the release of drug. Thus, 2 reasonable factors; preference of people and dominant character of ginger taste, convinced us not to apply any flavoring agent. Adding cinnamon as flavorant, although has gotten fewer score than ginger from taste panel test, [Table 5] but it would combine with ginger spicy taste. Due to pungent character of cinnamon as well, this mixture was more pleasant than adding other flavorings as it can be seen in [Table 4] considering the summations of scores. Using glycerin and liquid glucose as softeners and plasticizers causes consumer-friendly texture, whose composition is less brittle and more softened. Analyzing the chewing gum samples for weight variation determination satisfied us about their accordance with EP criteria. None of the 20 samples which were selected randomly exceeded 5% limitation of EP. The content uniformity determination tests resulted in numbers which were within EP 85–115% limitation and no sample neither the lowest content nor the highest was out of this range. The release patterns of six different chewing gums in 2 distinct categories were analyzed; 3 formulations with different ratios of gum bases and 3 formulations with various types and amounts of sweeteners were examined. When analyzing the first category, it was perceived that increasing the ratio of harder gum bases (elvasti and 487) decreases the rate of release. It means that the longer period of time is needed to release the entire drug, but the softer gum bases (fruit C and stick) caused phenolic compounds to be released more quickly than harder gum bases. Analyzing the second category showed that type of sweeteners impressed the rate of release slightly to be considered. These little differences are due to the nature of sweeteners (sugar sweeteners or sugarless sweeteners). The release of nicotine within 20 min was calculated 79–83% in most of 2 and 4 mg formulations in a study by Aslani and Rafiei. The drug release from green tea chewing gum at 30 and 45 min after mastication was reported approximately 76 and 96% due to another study by Aslani et al. The little difference may relate to various sweeteners applied in the content. After calculation of drug release kinetics for zero and first order release and Higuchi model, the results of release constants (K0 and K1) and Higuchi dissolution constant (KH) are represented in [Table 6]. As we can see, the r-squared values (R2) of zero order release and Higuchi model of release are approximately fewer than r-squared values (R2) of the first order release. This fact demonstrates the first order release of drug. Most of the medicines like dimenhydrinate hydrochloride, which are used for motion sickness should be taken about 30 min before activity or travel, as well as this medicated chewing gum should be taken 30–45 min before travel based on our study, since the release of drug is completed after this time. Mehta et al. demonstrated that 72–77% of dimenhydrinate hydrochloride is released after 30 min of chewing and 95–99% is released after 45 min with the same conditions as our study. Tensile behavior of F13, F14, and F15 is illustrated in [Figure 3], the sample was loaded and the elongation or extension over a distance between gauges of the machine was obtained. In fact, the specimen responded to the load or stress applied by the machine and its response as elongation was converted to strain. In the outset of the curve, we can observe the linear relationship between stress and strain where the ratio of stress to strain is constant and the gum obeys Hook's law. This ratio exhibits modulus of elasticity or Young's modulus. It means that if the load is removed the gum will return to its previous condition. All experimented chewing gums had the Young's modulus of 1, 0.8, 2.06 MPa for F13, F14 and F15; it means that the stiffness of gums in the beginning of chewing for F15 is slightly, but not considerably more than F13 because the Young's modulus measures the stiffness of a material. For longer elastic limit of F15 we can consider higher elastic behavior for formulations with more amounts of elvasti and 487. The point where the curve is no longer linear and deviates from the straight line is yield point or yield strength. After this point, the material shows plastic behavior. The specimen will not return to its exact condition by removing the applied load. After yield strength, permanent deformation will occur and Hook's law is no longer applicable. 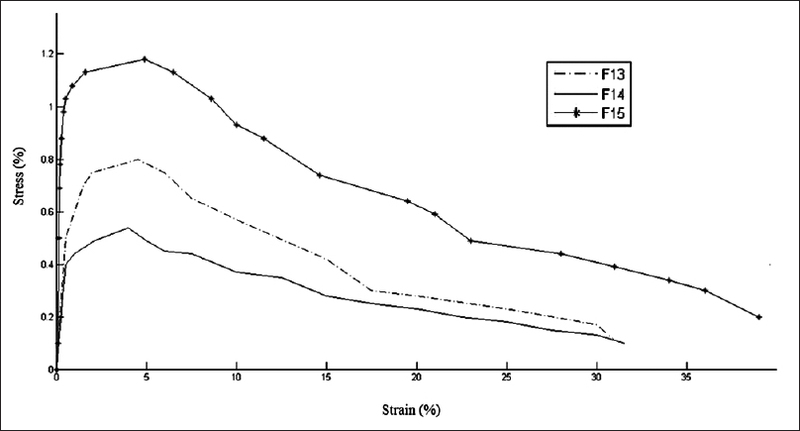 The yield point is usually hard to determine but as illustrated in [Figure 3], the yield strength of F15 with more proportion of harder gum bases occurred at higher stress than 2 other formulations. Thus, its persistence while chewing was more than F13 and F14 and it exhibited more elasticity than others. While these 2 formulations with more fruit C and stick proportional to elvasti and 487 had lower ability to persist. The UTS is the maximum load the material tolerates. In ductile materials like chewing gum, the UTS is outside the elastic portion and will occur at plastic limitation. The UTS is the highest point at stress-strain curve, where the slope is inverted. The UTS does not necessarily happen at breaking strength as we can see the stress is stepping down from UTS to fracture point. The area under stress-strain curve is called the amount of energy the gum endures before breaking. F15 had the major area; it shows that F15 needed more energy to be broken. The results rather confirmed other results conducted by Aslani et al. By considering the results of our study, ginger hydro-alcoholic extract obtained from percolation has beneficial active compounds that help motion sickness and other mentioned diseases consequently. Ginger chewing gum with efficient active ingredients can be formulated based on this study. The release of the active agent is acceptable as the gum nearly passed the EP protocols. Best formulations contain no extra flavoring agents. The mixture of different sweeteners provides a better taste and sense. According to organoleptic properties, last formulations from F10 to F15 considered to be the best among others. This study was supported by Isfahan University of Medical Sciences as a thesis research project numbered 393143. Benzie IF, Wachtel-Galor S, Bode AM, Dong Z. The amazing and mighty ginger. Ch. 7. 2nd ed; New York, CRC press, 2011. Altman RD, Marcussen KC. Effects of a ginger extract on knee pain in patients with osteoarthritis. Arthritis Rheum 2001;44:2531-8. Lien HC, Sun WM, Chen YH, Kim H, Hasler W, Owyang C. Effects of ginger on motion sickness and gastric slow-wave dysrhythmias induced by circular vection. Am J Physiol Gastrointest Liver Physiol 2003;284:481-9. Tiran D. Ginger to reduce nausea and vomiting during pregnancy: Evidence of effectiveness is not the same as proof of safety. Complement Ther Clin Pract 2012;18:22-5. Chakraborty D, Mukherjee A, Sikdar S, Paul A, Ghosh S, Khuda-Bukhsh AR. -Gingerol isolated from ginger attenuates sodium arsenite induced oxidative stress and plays a corrective role in improving insulin signaling in mice. Toxicol Lett 2012;210:34-43. Mustafa T, Srivastava KC. Ginger (Zingiber officinale) in migraine headache. J Ethnopharmacol 1990;29:267-73. Minaiyan M, Ghannadi A, Mahzouni P, Nabi-Meibodi M. Anti-ulcerogenic effect of ginger (rhizome of Zingiber officinale Roscoe) hydroalcoholic extract on acetic acid-induced acute colitis in rats. Res Pharm Sci 2008;3:15-22. Shukla Y, Singh M. Cancer preventive properties of ginger: A brief review. Food Chem Toxicol 2007;45:683-90. Ghasemzadeh A, Jaafar HZ, Rahmat A. Synthesis of phenolics and flavonoids in ginger (Zingiber officinale Roscoe) and their effects on photosynthesis rate. Int J Mol Sci 2010;11:4539-55. Oboh G, Akinyemi AJ, Ademiluyi AO. Antioxidant and inhibitory effect of red ginger (Zingiber officinale var. Rubra) and white ginger (Zingiber officinale Roscoe) on Fe(2) induced lipid peroxidation in rat brain in vitro. Exp Toxicol Pathol 2012;64:31-6. Minaiyan M, Ghannadi A, Karimzadeh A. Anti-ulcerogenic effect of ginger (rhizome of Zingiber officinale Roscoe) on cystemine induced duodenal ulcer in rats. Daru J Pharm Sci 2006;14:97-101. Rashidian A, Mehrzadi S, Ghannadi AR, Mahzooni P, Sadr S, Minaiyan M. Protective effect of ginger volatile oil against acetic acid-induced colitis in rats: A light microscopic evaluation. J Integr Med 2014;12:115-20. Chaudhary SA, Shahiwala AF. Directly compressible medicated chewing gum formulation for quick relief from common cold. Int J Pharm Investig 2012;2:123-33. Ali BH, Blunden G, Tanira MO, Nemmar A. Some phytochemical, pharmacological and toxicological properties of ginger (Zingiber officinale Roscoe): A review of recent research. Food Chem Toxicol 2008;46:409-20. Kaul PN, Joshi BS. Alternative medicine: Herbal drugs and their critical appraisal – Part II. Prog Drug Res 2001;57:1-75. Chrubasik S, Pittler MH, Roufogalis BD. Zingiberis rhizoma: A comprehensive review on the ginger effect and efficacy profiles. Phytomedicine 2005;12:684-701. Windeck T, Ploch M, Verspohl EJ. Mode of action of gingerols and shogaols on 5-HT3 receptors: Binding studies, cation uptake by the receptor channel and contraction of isolated guinea-pig ileum. Eur J Pharmacol 2006;530:136-43. Wang H, Ng TB. An antifungal protein from ginger rhizomes. Biochem Biophys Res Commun 2005;336:100-4. Qian QH, Yue W, Wang YX, Yang ZH, Liu ZT, Chen WH. Gingerol inhibits cisplatin-induced vomiting by down regulating 5-hydroxytryptamine, dopamine and substance P expression in minks. Arch Pharm Res 2009;32:565-73. Gadhavi AG, Patel BN, Patel DM, Patel CN. Medicated chewing gum - A 21st century drug delivery system. Int J Pharm Sci Res 2011;2:1961-74. Rassing MR. Chewing gum as a drug delivery system. Adv Drug Deliv Rev 1994;13:89-121. Imfeld T. Chewing gum – Facts and fiction: A review of gum-chewing and oral health. Crit Rev Oral Biol Med 1999;10:405-19. Asija R, Patel S, Asija S. Oral dosages form: Medicine containing chewimg gum: A review. J Drug Deliv Ther 2012;2: 90-5. Heema N, Stuti G. Medicated chewing gums-updated review. Int J Pharm Res Dev 2010;2:66-76. Rathbone MJ, Hadgraft J, Roberts MS. Modified-Release Drug Delivery Technology. New York: CRC Press; 2002. Smith AP, Woods M. Effects of chewing gum on the stress and work of university students. Appetite 2012;58:1037-40. Available from: http://www.gumassociation.org. [Last accessed on 13 July 2014]. Directorate for the Quality of Medicine and Health Care of the Council of Europe. European Pharmacopoeia. 7th ed. Strasbourg: Directorate for the Quality of Medicine and Health Care of the Council of Europe; 2009. p. 289, 709. Pandey S, Goyani M, Devmurari V. Development, in-vitro evaluation and physical characterization of medicated chewing gum: Chlorhexidine gluconate. Der Pharmacia Lettre 2009;1:286-92. Aslani A, Ghannadi A, Mortazavi S, Torabi M. Design, formulation and evaluation of medicinal chewing gum by the extract of Salvadora persica L. Life Sci J 2013;10:47-55. Aslani A, Rafiei S. Design, formulation and evaluation of nicotine chewing gum. Adv Biomed Res 2012;1:57. Aslani A, Ghannadi A, Khalafi Z. Design, formulation and evaluation of green tea chewing gum. Adv Biomed Res 2014;3:142. Aslani A, Jalilian F. Design, formulation and evaluation of caffeine chewing gum. Adv Biomed Res 2013;2:72. Sameja K, Raval V, Asodiya H, Patadiya D. Chewing gum: A modern approach to oral mucosal drug delivery. Int J Pharm Res Dev 2011;4:001-16. Ughade MA, Wasankar SR, Deshmukh AD, Burghate RM, Makeshwar KB. Medicated chewing gum: Modern approach to mucosal drug delivery. Asian J Res Pharm Sci 2012;2:150-9. Cosgrove T, Erol AH, Voss MG. Chewing GUM Composition, Publication date: 2010-08-26 Patent application number: 20100215799. Khatun S, Sutradhar KB. Medicated chewing gum: An unconventional drug delivery system. Int Curr Pharm J 2012;1:86-91. Minaiyan M, Ghannadi A, Etemad M, Mahzouni P. A study of the effects of Cydonia oblonga Miller (Quince) on TNBS-induced ulcerative colitis in rats. Res Pharm Sci 2012;7:103-10. Waterhouse A. Determination of Total Phenolics. Current Protocols in Food Analytical Chemistry. New York: John Wiley; 2002. Makkar HP. Quantification of Tannins in Tree and Shrub Foliage: A Laboratory Manual. New York: Springer; 2003. Kubra IR, Rao LJ. Separation of polyphenol rich fraction from dried ginger rhizomes. J Appl Chem 2012;1:368-75. Kishk YF, El-Sheshetawy HE. Optimization of ginger (Zingiber officinale) phenolics extraction conditions and its antioxidant and radical scavenging activities using response surface methodology. World J Dairy Food Sci 2012;5:188-96. Pawar N, Pai S, Kolar F, Dixit G, Nimbalkar M. RP-HPLC analysis of 6-gingerol and assessment of antioxidant activities in EMS treated ginger. J Phytol 2010;2:13-21. Mishra RK, Kumar A, Kumar A. Pharmacological activity of Zingiber officinale. Int J Pharm Bio Sci 2012;1:1073-8. Baliga MS, Haniadka R, Pereira MM, D'Souza JJ, Pallaty PL, Bhat HP, et al. Update on the chemopreventive effects of ginger and its phytochemicals. Crit Rev Food Sci Nutr 2011;51:499-523. Mehta F, Kartikayen C, Trivedi P. Formulation and characterization of medicated chewing gum delivery of diphenhydramine hydrochloride. Der Pharmacia Sinica 2011;2:182-93.